Katelyn is an active nine-year-old who loves playing outdoors. Katelyn really wanted to ride a bike just like her brother and sister. Katelyn has cerebral palsy and uses a walker and wheelchair to assist with her mobility. Due to her condition, she experiences muscle spasms throughout her body. Katelyn received her first Freedom Wheels bike just in time for her fifth birthday since then, she’s been out-and-about, riding independently and playing with her siblings. Katelyn is now on her second Freedom Wheels bike. Mum, Dionne says, that riding has helped Katelyn achieve many of her therapy goals. They have noticed an improvement in Katelyn’s hand strength from gripping onto the custom handlebars, and the special foot supports on her bike encourage her to straighten her legs. 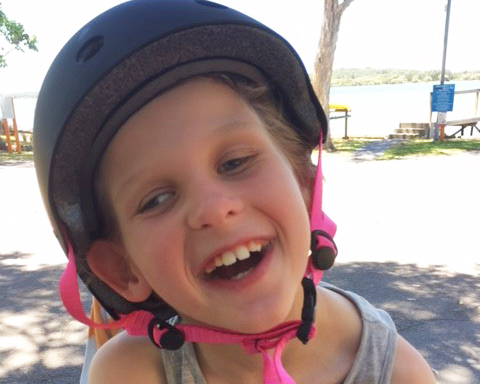 Dionne says that Katelyn is not only gaining physical benefits from riding her Freedom Wheels bike but she is growing more in confidence as she can ride with her siblings around their favourite camping site.